Gestational diabetes (GD) is a form of diabetes that specifically develops during pregnancy. Gestational diabetes occurs following the body becoming resistant to the effects of insulin. There are a number of causes of gestational diabetes with the effect of placental hormones being one of the most significant causes. Gestational diabetes usually subsides after pregnancy but can sometimes remain as type 2 diabetes. These hormones, and HPL in particular, reduce the effectiveness of insulin. As your baby grows, a higher level of these hormones are needed and, as a result, the further into your pregnancy you are the higher the likelihood of developing insulin resistance and gestational diabetes. These hormones are produced by the placenta during pregnancy and assist with feeding and growth of the baby. During pregnancy, levels of these hormones increase significantly, with hPL increasing by up to 30 times and hPGH increasing by up to 8 times. Research indicates that both of these hormones can lead to increased, and even severe, insulin resistance. Gestational diabetes and type 2 diabetes are closely linked and women that develop gestational diabetes will usually have insulin resistance to some extent before their pregnancy. As a result, the factors that are known to cause type 2 diabetes also contribute to the development of gestational diabetes. Having a significant amount of visceral fat growing around main organs such as the liver, pancreas and digestive organs can cause insulin resistance and therefore contributes to the development of insulin resistance. A build up of visceral fat is more likely to occur if you have a BMI value over 30. Genetics is also known to be a contributing causal factor. 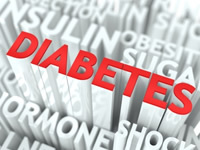 If you have one or more close family members with type 2 diabetes, there is a higher likelihood that you may have an increased genetic susceptibility towards type 2 diabetes and gestational diabetes. If you have had gestational diabetes, you have a greater chance of developing type 2 diabetes later in life. Whilst blood glucose levels will usually return to normal level after pregnancy, in some women, high blood glucose levels may persist as type 2 diabetes.